A batch of articles this week in the Southwestern College (SWC) student newspaper The Sun are further testimony to the turmoil at the California college, where a financial crunch has begotten a full-blown free speech crisis. SWC’s wholly avoidable clash with the First Amendment began on October 22, when a group of students assembled on SWC’s “free speech patio” to protest various class and budget cuts at the college. Yes, it’s as bad as it sounds: this “patio” is the one place for free speech and assembly on campus, and it must be reserved ahead of time. That evening, each of the three faculty members received hand-delivered letters from SWC’s director of human resources, who arrived accompanied by a police officer. The letters informed each of the three that he or she had been placed on administrative leave from the college and were banned from campus under the California Penal Code, effective immediately, pending an investigation. For what? They had no idea. Alioto, in a later e-mail to the SWC community, denied that such action amounted to a suspension. Chopra, for his part, gave an unconvincing and contradictory defense of the incident to the San Diego Union-Tribune. 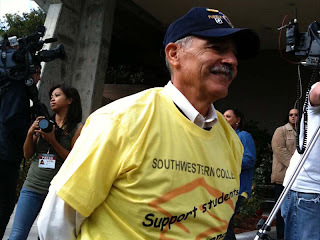 The incident garnered significant media attention, and both FIRE and the ACLU of San Diego and Imperial Counties condemned SWC’s retaliatory act in letters to President Chopra. While the three faculty members were allowed to return to campus on November 4 and SWC asked that the criminal investigation against them be dropped, SWC formally reprimanded the three professors on the basis of a so-called independent investigation into the incident that was funded by SWC and, unsurprisingly, found a different alleged transgression for which to fault each of the three professors. Disappointingly, SWC has allowed the controversy to go on unresolved. As numerous articles this week in The Sun report, however, the SWC community is beginning to push back. One hot-button issue the Sun touches on is the final report of the so-called independent investigation, bitterly panned by the SWC faculty. The investigation, conducted by local attorney Nancy Solomon at the behest of Acting Superintendent/President Alioto, in large part sided with SWC’s version of the events-a serious finding, given that the college was considering criminal charges. As it was, among the charges to be investigated were inciting the students to leave the free speech area, disregarding orders from the police to leave the area around the president’s office, and physically confronting the officers when refusing to do so. Doing so likely would have helped. Among other things, Solomon concluded that “overwhelming evidence suggests that [English instructor Phil Lopez] was in some manner physically aggressive or at least threatening to be so.” Lopez and numerous other eyewitnesses hotly contest this charge. Indeed, FIRE has a hard time believing it, as well, given that the photographs we have seen from the rally hardly suggest a confrontational atmosphere. Even the report has to stretch to find that Lopez somehow puffed out his chest in some kind of menacing way. Besides, SWC has never disputed the account of the rally-free of any hint of such physical aggression-that FIRE provided in our letter based on eyewitness accounts. For this self-serving report, SWC was willing to pay as much as $15,000. This figure makes the report a double insult to the SWC community, insofar as the report was an unnecessary expense in a time of very severe budget problems at SWC. Indeed, by November 13, mere days after the release of Solomon’s report, Alioto (whose stint as acting president was set to end that day), sent an e-mail statement to the SWC community informing them that he had ordered the investigation discontinued, and had instructed that charges not be forwarded to the district attorney. SWC still has much work ahead. For one, the letters of reprimand delivered to the faculty members must be rescinded and removed from their employment files-promptly. Equally crucial is that SWC’s appalling policy on its “free speech patio” be rescinded immediately. This policy exiles student expression to an area representing a tiny percentage of SWC’s 156-acre campus. SWC even declares that the rest of the campus is a non-public forum, which is blatantly unconstitutional. In so doing, SWC has deemed the most traditional locations for free speech, such as green areas on campus, to be off-limits to free expression. In fact, a rally taking place on November 13, barely an hour after Alioto’s e-mail dropping the investigation was circulated, took aim at this unconstitutional policy, as well as at the atmosphere of fear and intimidation pervading SWC. Of course, FIRE is carefully monitoring all developments at SWC and is in touch with students, faculty, and other organizations, like the ACLU-SD, that are working to change SWC’s unconstitutional policies and oppressive culture. We’re confident that, working together, we can change SWC for the better. As always, we’ll keep you posted.